I’ve never had breakfast at Tiffany’s, but I think lunch with Tiffany—at Blue Duck Tavern–probably takes the cake. 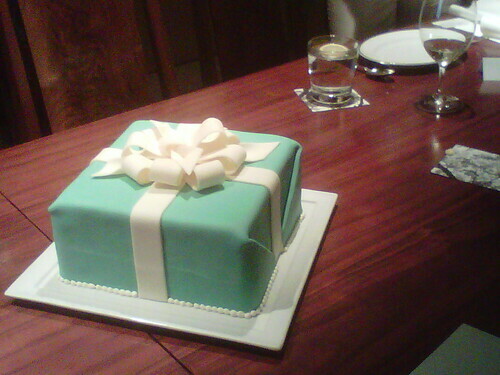 A Tiffany Blue cake, to the specific. Last Wednesday I attended an intimate luncheon to celebrate the legendary jeweler’s 175th year. The event involved many of my favorite things: pretty, sparkly jewelry, amazing food and wonderful company. I caught up with seatmates Sarah Schaffer (Capitol File) and Jennifer Barger (Express, FW) and got to know Tiffany Group Director Bryant Rice, who not only gave me a bit of insight about his day-to-day (basically, making sure lots of people are happy) but also gave me the lowdown on cult spirits brand Pappy Van Winkle and his own background as a jewelry maker. Nothing bonds folks quite like food, and so we ate a lot of it: plate after plate of beet salad, country pate, duck confit, truffle risotto, truffle-glazed scallops, and the most to-die-for stone-ground grits…to name just a few items on our custom menu. We had our Tiffany and ate it too: after presenting each course, Chef Sebastien Archambault brought to the table the most delightfully girlie dessert: a chocolate cake made to look precisely like a Tiffany box. To top it off? A tall vase full of scoops of candy cane-flavored ice cream. In Tiffany Blue, natch. Tiffany has an incredible history. I was once given a stack of gorgeous coffee-table books about the company and now I’m eager to go through them to learn more (for instance, did you know that Tiffany redesigned the Great Seal of the United States, found at the center of the dollar bill, in 1885?). Impressive is a somewhat recent expansion of the brand’s offerings, into handbags and small leather goods. I encourage all of you to wander into the store at The Collection at Chevy Chase just to see them, because each one is perfectly and thoughtfully made. The weight is perfect, the materials are sumptuous. Many are lined in, piped with, or just gloriously wear the Tiffany Blue shade in a manner so classic and surprising that it’s a wonder these goods took til 2010 to be introduced. Many of them are convertible in some way, whether a chain that removes to serve as a necklace or a tote that flips inside out, from daytime color to nighttime metallic. These are serious bags that have been made with care and attention to the customer’s needs. I covet them all. 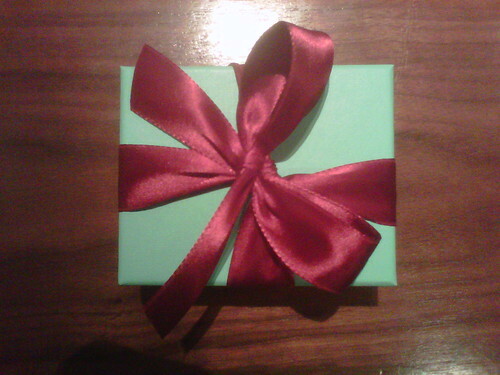 Needless to say, I’m looking forward to watching Tiffany as it unveils more anniversary pieces this spring. Here’s to 175 more years! **I also look forward to transitioning from a Blackberry to an iPhone in the new year….sorry for the subpar photos! This week I caught up with Paula Mendoza, whose eponymous line of earthy-yet-glamorous jewelry has graced the pages of Vogue, O (Oprah) magazine, and D.C.-based publications including Washington Life and DC magazine (and here on PB, natch). I came across her work in 2008 at *Muleh, which still carries her line (the line is also carried at Tabandeh at Mazza Gallerie/Friendship Heights). The Colombian-born designer left DC for New York two years ago, and has since expanded her following from DC’s fashiony set to Isabella Rossellini and many others. I thought I’d catch up with Paula to talk about her new line, “New York Icons,” and what makes someone iconic, anyway. What makes someone an icon? People on the streets of NYC inspire me, they are so individual and unique, each person carries their own story in the way that they dress and it is so inspiring to watch it. This is a collection full of passion, and full of my own experience living here. I follow a couple of blogs: The Sartorialist, Garance Dore, Man Repeller, and All The Pretty Birds. If you weren’t designing jewelry, what would you be doing? Tricky question, because I love with all my heart what I do, and I can’t see myself doing anything else. I am very lucky and blessed actually. Who are some of DC’s ‘icons’ and why? can you name one or two and describe what you’d make for them? Oh my God, Michelle Obama is a complete icon, she is absolutely stunning, and her style is, like I said, timeless and unique. I named my Michelle earrings for her. I like that there’s some Beltway flair in the collection! What do you miss about DC? My friends and Cork, the incredible little restaurant on 14th Street! *Muleh opened a pop-up location in Georgetown, just in time for the holidays. Read more on Refinery29.